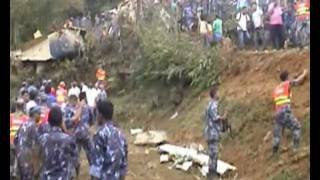 Breaking News From Nepal – A small airplane of the Buddha Air crashed in the southern hills of Kathmandu on Sunday morning killing all 19 people aboard including the crew members. Eighteen dead bodies were recovered from the site and one died in the hospital while undergoing treatment, according to SP Bhog Bahadur Thapa, who is overseeing rescue operations. In all, there were 19 people?ten Indian, two American, a Japanese, three Nepalese and three have not been identified yet. The aircraft was approaching Kathmandu airport in cloudy weather after completing its mountain flight.